Author Written by Osemerin Ndidi-Nwudu and last updated on Posted on September 13, 2017 . The Materials Management (MM) module is the business process area that handles daily activities of a business such as Procurement, Inventory Management, Materials Requirement Planning, Master data (Material and Vendor), Material Valuation, Vendor Evaluation, Invoice Verification and so on. Most business that operate in the manufacturing sector find this SAP module very useful as it helps in optimizing business processes. This article will provide SAP MM overview that will be help to quickly understand functionality of this SAP module. Why Companies Need SAP MM and What This Module Does? Most companies that run a large and robust supply chain processes would find MM very useful in their day-to-day business operations. One major importance of MM is in its ability for accurate stock taking which is very useful to the manufacturing industry where material availability for use in production activities is of utmost importance as this has the potential to either make or mar the production cycle. Hence, MM plays a vital role in Materials Requirement Planning for manufacturing companies with particular importance to those who deal in fast moving consumer goods. Another importance of MM to companies is in its procurement mix which involves the procurement of materials of stock and non-stock and also the procurement of services. It also helps in the management of waste and reduction in duplicity of inventory stock items. With the use of this module, most companies are able to keep accurate records of their stock inventory, have a proper audit of material valuation, and stock tracking in the various regions of business operations. Hence, the module helps to promote a centralized repository of total company inventory stock. Also, procurement can be centralized and used to capture all associated cost elements such as freight cost, custom duties, transport/delivery charges, loading and unloading charges etc. With this module procurement is also able to liaise with stores to monitor closely demand and supply of material stock in order to ensure optimal stock levels are observed at all times during the production cycle. 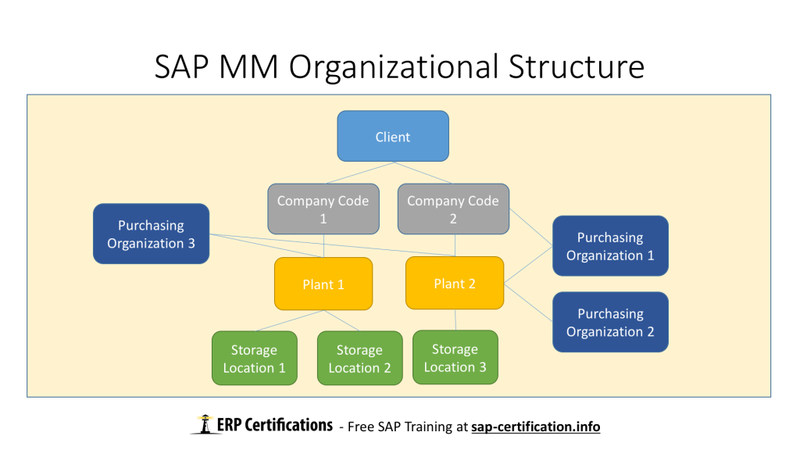 Next, let us describe organizational units of Material Management in our SAP MM overview. Most companies have a framework upon which their business operations are conducted. This framework is usually referred to as organization structure or in SAP parlance enterprise structure. The enterprise structure is composed of a number of organizational units which relates to one another. To establish this relationship between the levels it is important that we assign them in such a way that they lie in the same hierarchy. Download this slide as PDF: SAP MM Organizational Structure PDF. Within the SAP system we consider a client as self-contained in terms of data, and it is the highest hierarchical level in the SAP system. All specifications as it relates to data entered at this level is applied to all company codes and all the other organizational units. In a particular R/3 system, we can have single or multiple company codes depending on the business requirements as it pertains to the company operations. Hence, a client key is usually used as a unique identifier when access to the respective clients are needed. Following the client is the company code where replication of independent accounts can be performed. It is the smallest unit in the organization where this takes place. This represent an independent unit of Balance Sheet, and Profit and Loss Accounting, e.g. as seen in a company within a corporate group. As stated earlier, several company codes can exist in a single client in order to thus keep separate sets of financial books. A plant is regarded the logistics unit within the organizational hierarchy handles the procurement of materials, services, production, materials valuation, materials planning, and inventory. In some other business scenarios, a plant can represent a Manufacturing Facility, a Distribution Centre, Sales Regions, Head offices (e.g., in banking sector) or a maintenance office (e.g., in maintenance planning plants) within a company. Differentiation of material stocks within a plant takes place at the storage location level. Here also, we monitor goods movements in and out of inventory and carry out physical inventory count to ascertain inventory levels at given periods. The purchasing organization unit is responsible for procurement of materials or services on behalf of the company. It also negotiates conditions of purchase with vendors. A purchasing organisation can procure for several company codes (centralized purchasing), specific company code (company specific), and specific plants (plant specific) depending on the configurations. This organizational unit is responsible for the everyday procurement activities that go on in an organization. Usually, they comprise a group of buyers, depending on the size of the company, and are responsible for procurement of goods and services. The main business processes in MM can be broken down into procurement, inventory management, material valuation, and materials requirement planning. Invoicing is inter-related and though sites in MM some companies prefer their Finance departments to handle this operation. Procurement begins from raising requisitions from requesting departments or process orders from production or work orders from maintenance or sales orders from sales unit, or as a result of materials reservation from the material planner. Next is for the procurement team to send out quotation request to source vendors for the procurement of these items of material or services. Vendor selection then takes place and purchase orders are generated capturing all the associated cost elements as agreed. Subsequently, upon delivery of the goods or services a good receipt is carried out or service entry and acceptance based on the scenario in play. For goods receipts, the various stocks inventory is updated and the system debits and credit the respective general ledger accounts automatically as configured in MM. Also, in inventory, depending on the stock type and its use, stocks are made available to production, projects, warehouse as the case may be. Service entry for value of work done is accepted and processed onwards to invoicing. This process most times looks at what value of items of stock of service was received and processes payments based on this information. In SAP MM this is referred to as the 3-way match. Hence, payments are based on goods receipt quantities not Purchase order quantities. The next section of SAP MM overview is related to integration. SAP MM is strongly integrated with other modules. 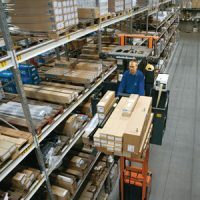 As the backbone of the logistics it is integrated with Production Planning (especially in Material Requirements Planning), Sales and Distribution, Warehouse Management, Transportation Management, Shipping, Environment, Health and safety, Quality Management (for stock materials that most pass through quality assurance procedure), Plant Maintenance (in the areas of bills of materials used for materials spares), Project Systems (WBS elements), and in newer SAP solution areas like Supply Chain Management (SCM), Supplier Relationship Management (SRM). SAP MM is also strongly integrated with Financials module as every postings occurring in inventory has direct impacts on general ledger accounts which report to balance sheet and profit and loss statements. Material valuation also integrates with Finance. It also integrates with the Controlling module in areas of budget controls for release for funds to procurement. Other areas of integration points are with Human Resource Management module in the use of organization level in defining release approval for purchase orders based on positions IDs of the responsible staff personnel. And in addition to this SAP MM overview, I would like to talk a little about Master Data in Materials Management. We have several master data in MM comprising: Materials Master Data, Vendor Master Data, Purchasing Information Records, and Source Lists. Here, based on the purpose for use of the material we can define the material type views, if it is non-stock, its valuation class, price control and valuation type if it is split evaluated. Vendors can be maintained centrally or to specific purchasing organization. Usually for each vendor a defined vendor account grouping code is used in its maintenance and this determines whether it is domestic, or foreign, or one-time vendor. This here is used to maintain information between various vendor and agreed price and cost elements for supply of stock materials. In MM what the system does is to refer to the price in the info record for any purchase order being created for that particular material against the vendor. Glad you like Alfred, you are welcome. This was a great tutorial. Thank you for your time and effort. It will be very helpful in my upcoming technical interview. My pleasure, glad it came useful for you. Thank you and really nice and compact article.Thank you again! This tutorial is very helpful and clear for me as SAP MM consultant. what’s Source List? can you explain to me? I have honours degree in logistics management and i want to acquire SAP skills because am thinking of starting my own logistics services business. Pleas what module should i focus on? Hello Anthony, with your logistics background I would suggest you take SAP Supply Chain Management (SCM) module with special focus areas being MM, WM, & TM. Please where and how do i find this module SAP SCM that will help me focus on MM, WM and TM. I don’t think WM and TM are currently being offered here. Material is of great help. Thanks guys! Voice is not clear while teaching. Really MM Module is much interesting & helpful for business activities. Is there somewhere I can find a printable file for these tutorials? Is there any way I can get software on my personal system/laptop ? How are you using it ? Thanks for the Nice Information!!!! Do you arrange training classes online as well?